Did you forget the ring meant for the groom and the bride is angry with you? Well, with a wedding checklist things would have been different. It would allow an individual or member associated with organizing a wedding to not even forget a single bouquet that is supposed be in the hands of a guest. 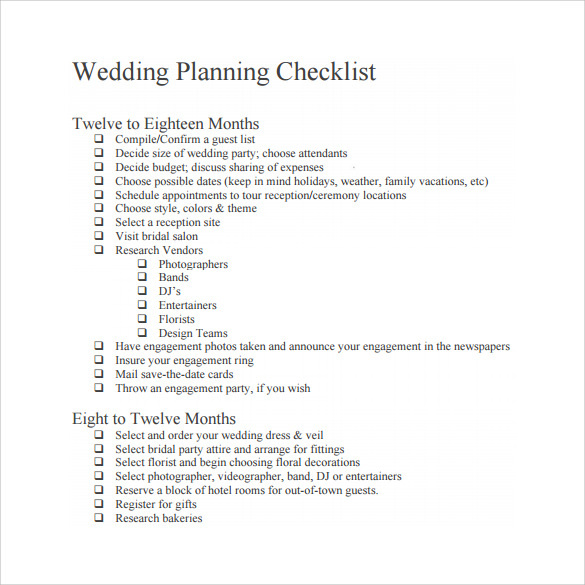 Take a look at our checklist templates and if you read any wedding Checklist Templates you would understand how easy it is to not forget something in such a great event as wedding. 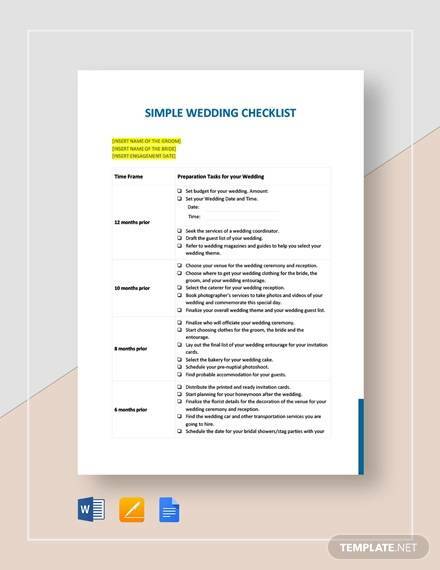 Further, you can download the selected Wedding checklist template from our wide range of templates in PSD, PDF or MS Word formats so that there won’t be any last minute tensions in the wedding. This is a very useful template to make a checklist of wedding photography, it is important to have fix dates and event for photography so that each memory of your wedding should preserved in form of photography. 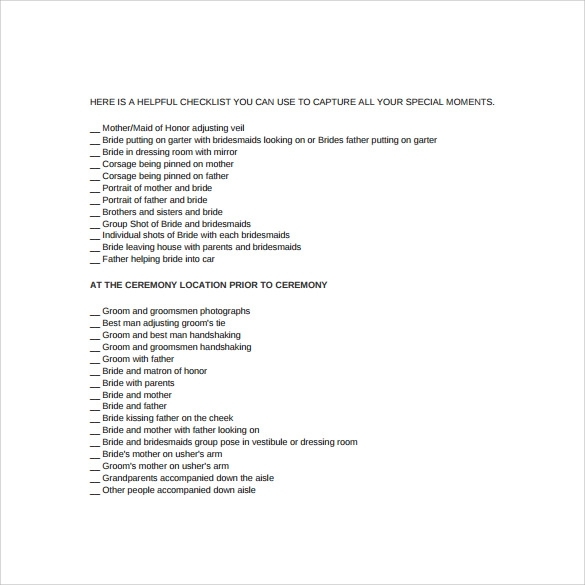 You can provide this checklist to group of photographers covering your photography so that they do not miss any single important event of your wedding. This wedding checklist contains the task you need to do before the wedding and on the wedding day. Wedding is big event and it must be planned carefully. This list will allow to mark the work done so far and will tell you about the pending work to be done. Starting from the visit of wedding planner’s office visit until the wedding day, this checklist contains all things to do for your wedding. 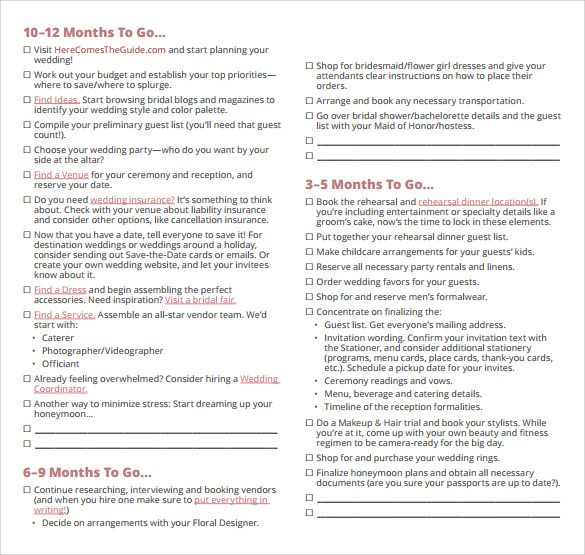 This is yet another effective checklist for wedding planning. It shows the work to be done 12 months before the wedding until the 3 months before the wedding. 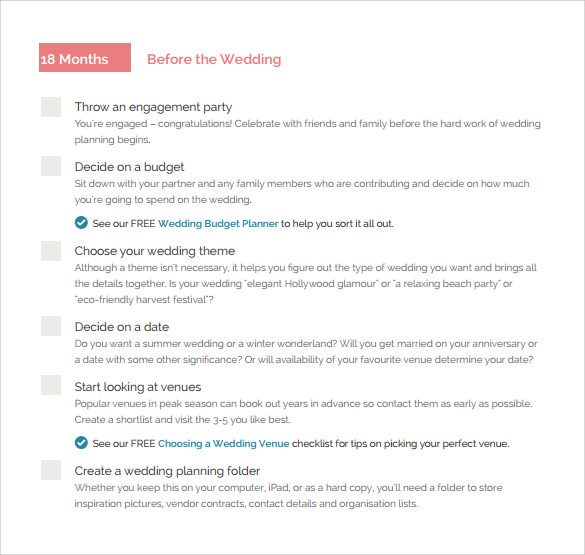 There is complete list of tasks given in this template for your wedding planning. You can also add more in this list according to your need. This is another fine example of wedding checklist. The template designed in PDF so you easily take print of it and can crosscheck the work done and remaining work done according to this checklist. 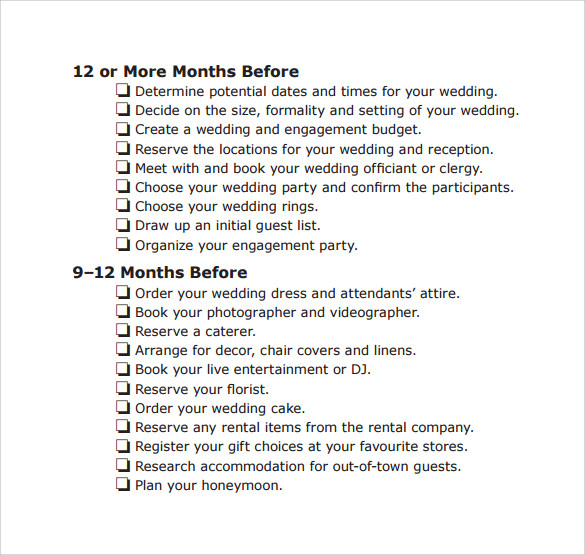 The checklist starts from the deciding the date of wedding until the 5 month before the big day. 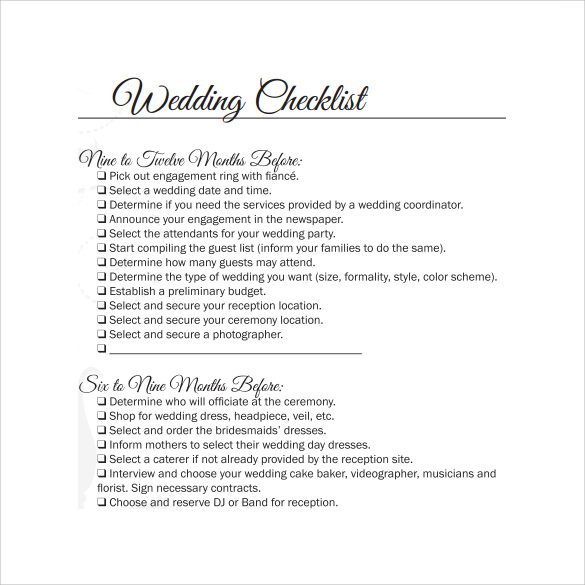 Why We Need Wedding Checklist Template? Also if you into wedding planning business then it becomes more important for you to plan a perfect wedding for the client and without a smart checklist it is not possible to have control on all events during wedding. 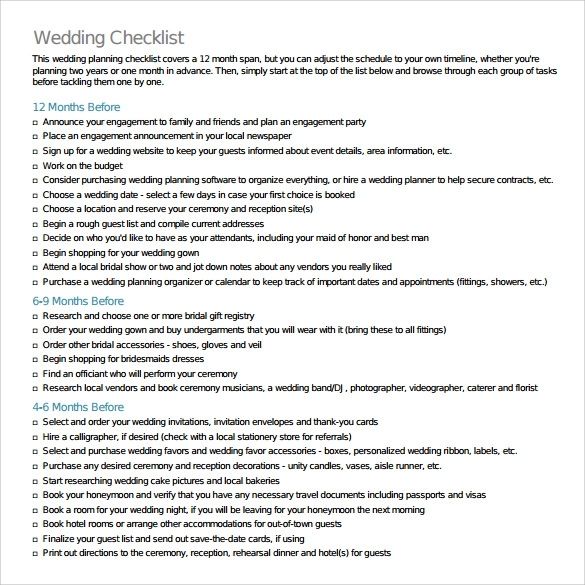 When We Need Wedding Checklist Templates? Wedding checklist is required at every step of wedding; even it is required much before the wedding day. 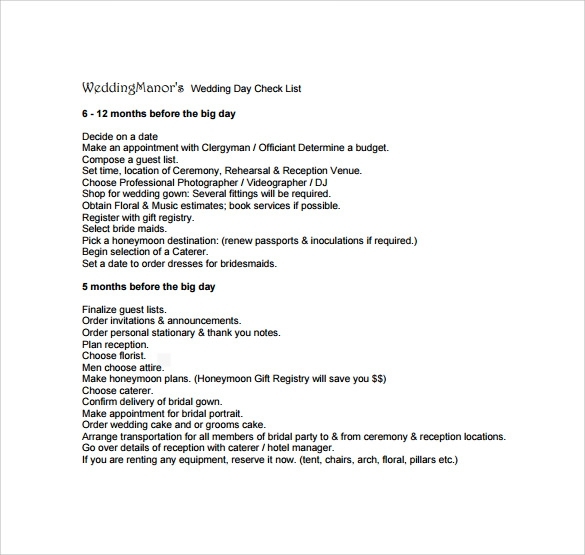 The good wedding checklist must be made carefully and one should note all task to be done for wedding in the checklist. A good wedding checklist will give a wedding planner full control of the vent and he/she can easily manage the event in an effective way. A checklist is required for every single task and it should be with the person concerned for that specific task so that he/she have a clear idea about the client’s requirement and what arrangement he/she has to do for the event. 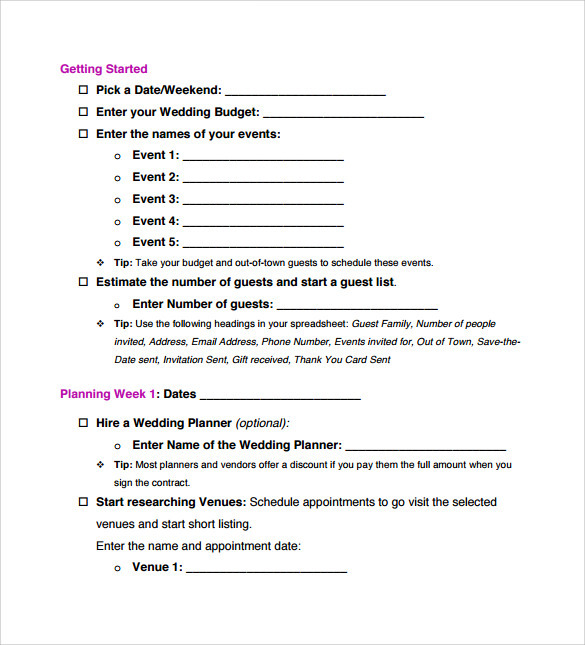 How These Wedding Checklist Templates Will Help You? 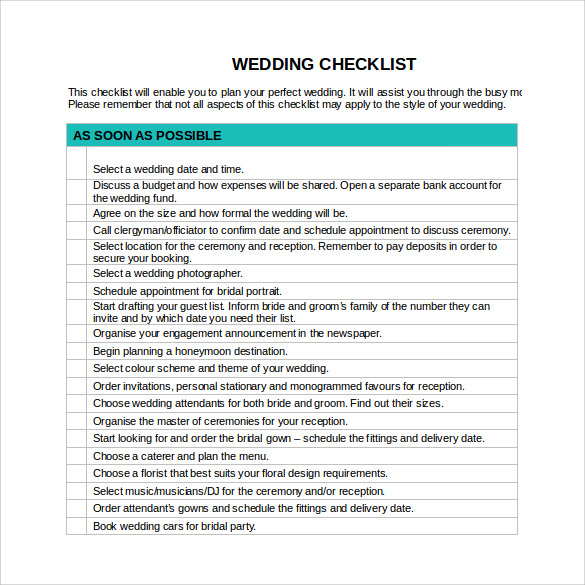 Therefore, you just need to download the desired checklist template from here and post adding your more requirement in the same checklist you can follow the checklist for your wedding. 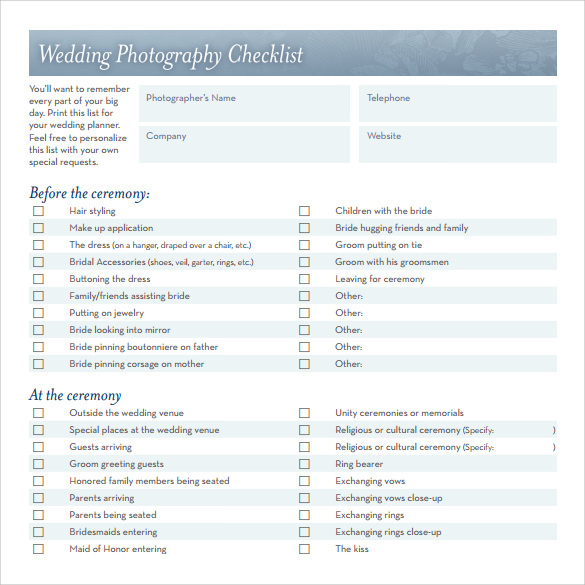 A good checklist will make your wedding a successful and beautiful event of your life. To plan any wedding a checklist is necessary thing, which allows the event organizer to take full control of the event. 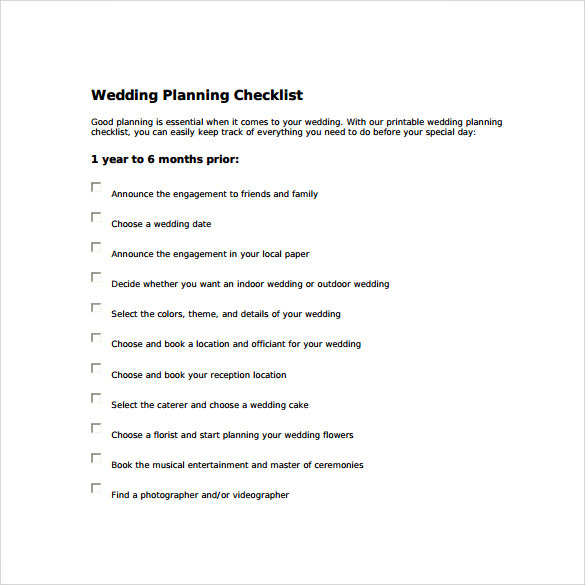 A good checklist also helps the couple being wedded together to plan their schedule and other things effectively. 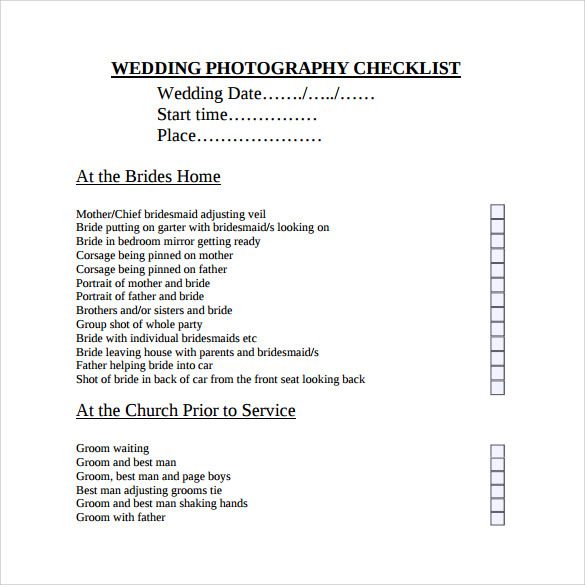 Templates given here are few fine example of wedding checklist and you can download and use them for your wedding checklist.